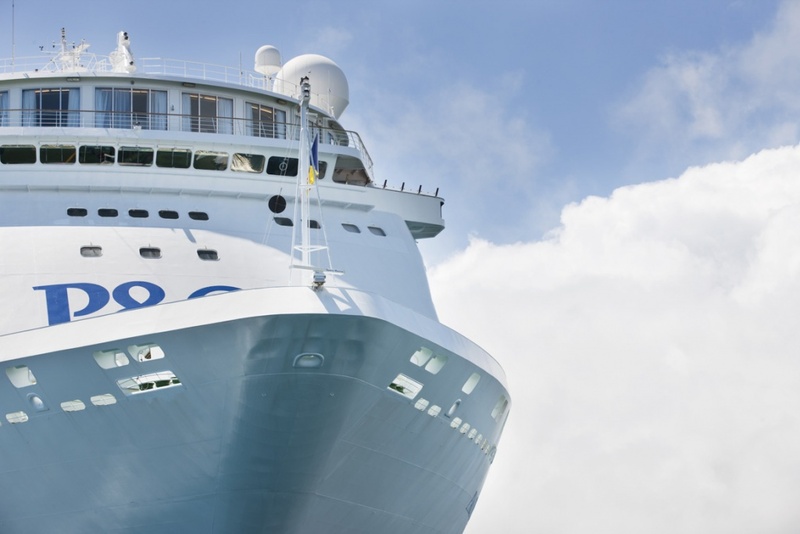 P&O have a strong presence in Australia, with six ships cruising around Australia, New Zealand and the South Pacific. Of these vessels, Pacific Pearl is the oldest, but in true P&O style, continual upgrades have improved facilities and amenities in creating a ship that satisfies modern cruising expectations. 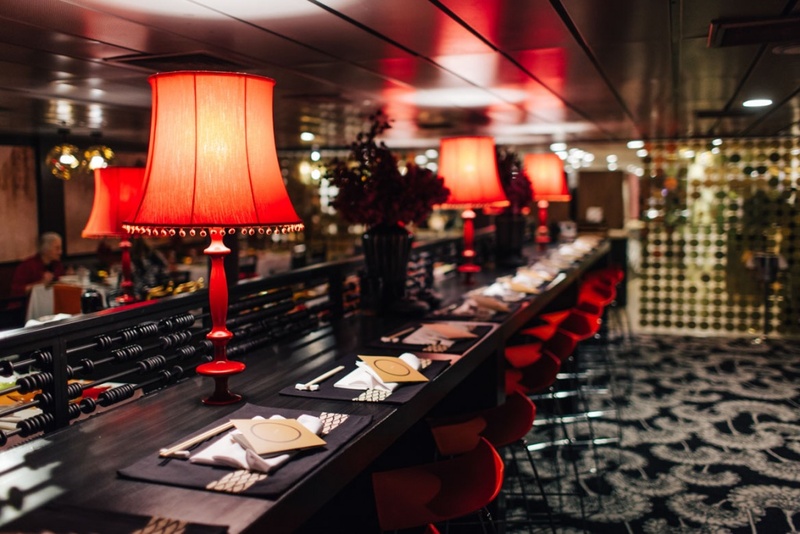 Prior to relocation in Australian waters, Pacific Pearl underwent a multimillion-dollar refurbishment that has transformed public spaces into inviting and contemporary areas. 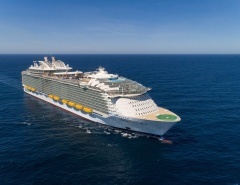 The suites have all been upgraded from top to bottom, and include the introduction of interconnecting cabins for families and larger tour groups. Cruise ship dining has taken a quantum leap in recent years, and Pacific Pearl offers more choices than ever. Flexible dining options are available, and new venues have been introduced to allow passengers a variety of culinary experiences. As Pearl is an older vessel, first launched in 1987, there are fewer balcony cabins than on newer ships, although Pearl is very good value for money for those wanting to experience the laid-back Australian style of cruising. The ship’s age means Pearl is extremely sturdy and able to comfortably ride any conditions in the Pacific Ocean and Tasman Sea. Although refurbishments have upgraded Pearl to a high standard, the lack of balcony cabins is still noticeable. Of the 773 cabins, only 64 have balconies. 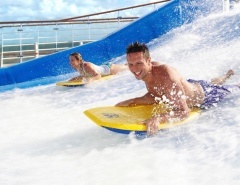 This can be a drawback for cruising the tropical waters or northern Australia and the South Pacific, however, Pearl is designed to attract passengers out of their rooms to explore the shipboard facilities and fabulous itinerary destinations. 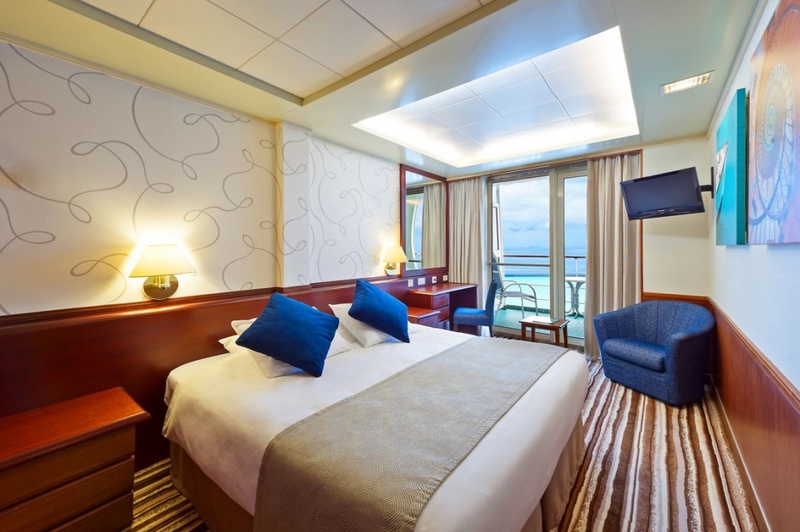 As a smaller and slightly older vessel, Pacific Pearl doesn’t have any multi-room suites, although this won’t affect the majority of cruisers. Of the 64 balcony accommodations, there are 36 mini-suites and 28 balcony staterooms. 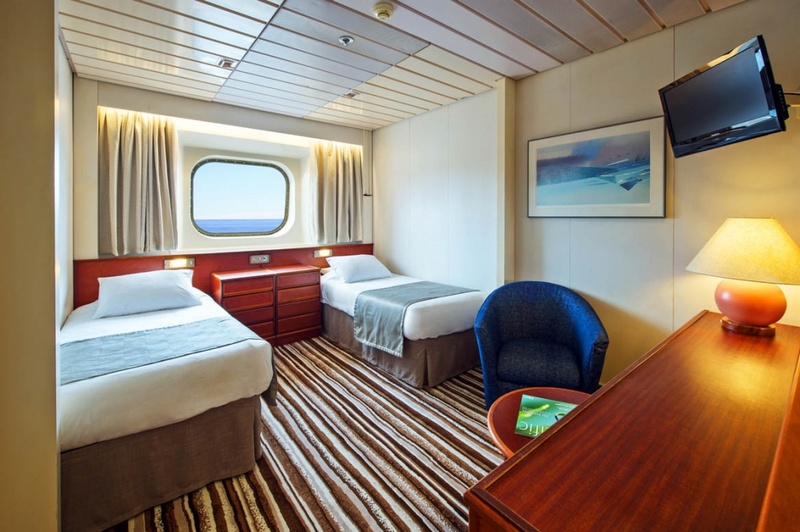 The mini-suites are larger than the staterooms, and have more expansive sitting areas and a longer balcony with sunloungers. All décor was updated in the 2012 refurbishment, resulting in elegant and comfortable rooms. The mini-suites also include a bathtub along with a shower. These suites have an extra bed for an additional guest, and priority services such as special cocktail parties, complimentary laundry, bathrobes, slippers, coffee machine and iPod music system are included. Outside staterooms have a balcony with a table and chairs. The cabins are an attractive arrangement of dark wood, classily upholstered seating and stylish drapes. An additional bed can also be configured for an extra passenger. There is plenty of closet space and all the amenities to make your cabin a suitable refuge as a home away from home. Standard outside cabins without a balcony are slightly smaller, and can sleep two to four people. 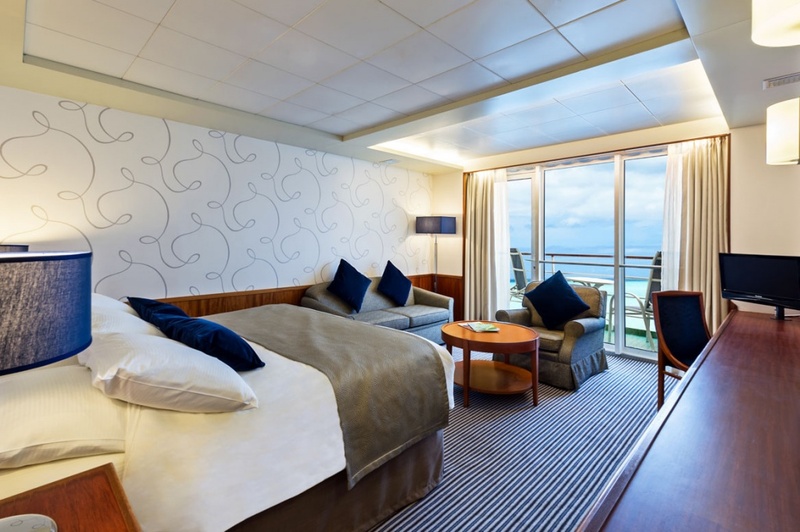 Attractive décor and comfortable furnishings are a reason why guests keep coming back to P&O. 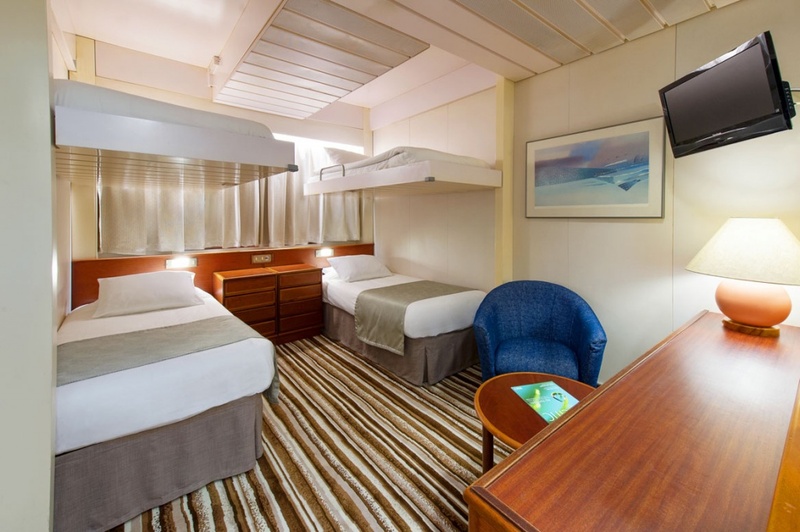 Inside staterooms are the same size as the outside ones, and also sleep up to four people. There is limited storage space expected of an older vessel. Standard inclusions in all rooms include a television, fridge, phone and toiletries. 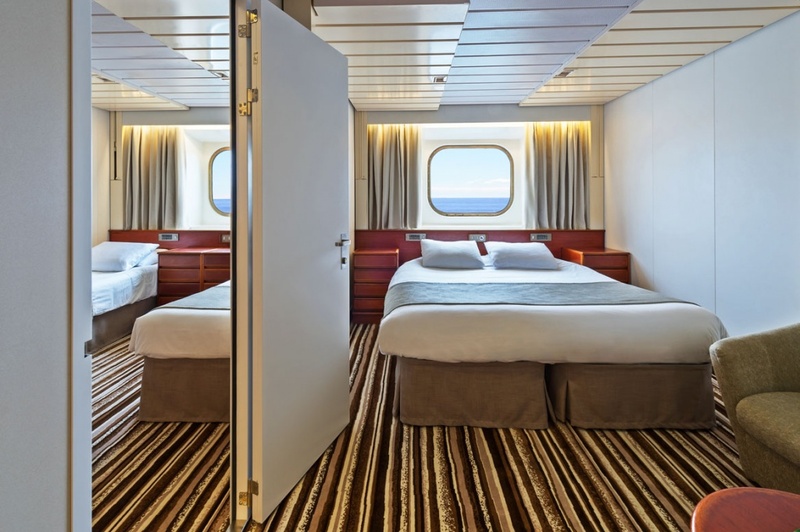 The 2012 Pacific Pearl upgrade introduced passengers to 10 pairs of interconnecting staterooms to suit the evolution of cruising to suit families and larger groups. A major improvement to Pacific Pearl has been the culinary experience. There are four main dining venues to satisfy a variety of tastes, and seatings to suit everyone from intimate couples to large travelling parties. The Waterfront: This is the main dining venue on Pearl. It is spacious and appealing, with an abundance of cosy areas for more private dining. There are also tables that accommodate up to ten people. 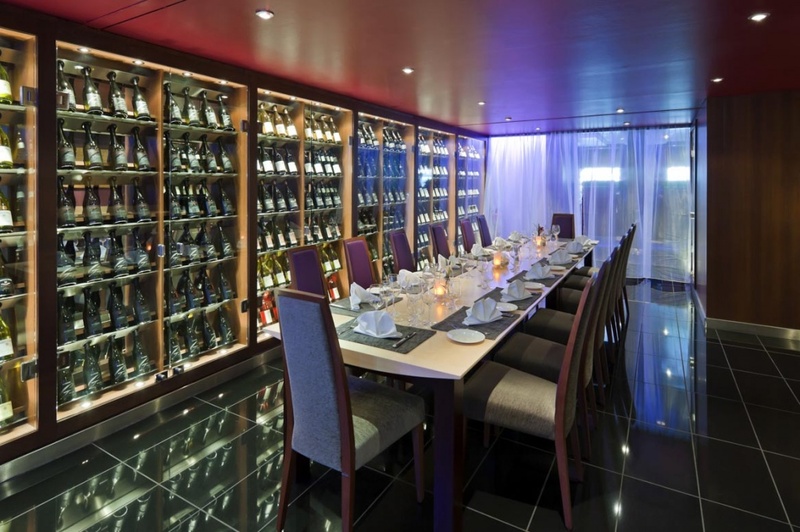 There is even a Wine Room space where tables are flanked by a great selection of wine and champagne. The Waterfront, open for breakfast, lunch and dinner, is a Your Choice Dining venue without traditional seating. This means you can choose your own dinner companions and eating times. 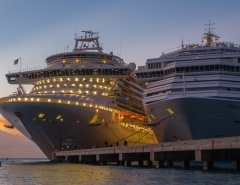 The range of foodstuffs is in keeping with the best cruise ships, and includes a la carte selections, large main courses and the introduction of local Australian and South Pacific ingredients such as King Island cheese and Vanuatu Tanna Coffee. Plantation Restaurant: This casual dining venue is decorated with warm woods, beige finishings and attractive highlights. An added bonus is the large outdoor dining area with ample seating. Open for breakfast, lunch and dinner, Plantation Restaurant is a healthy, hearty and satisfying place to dine. 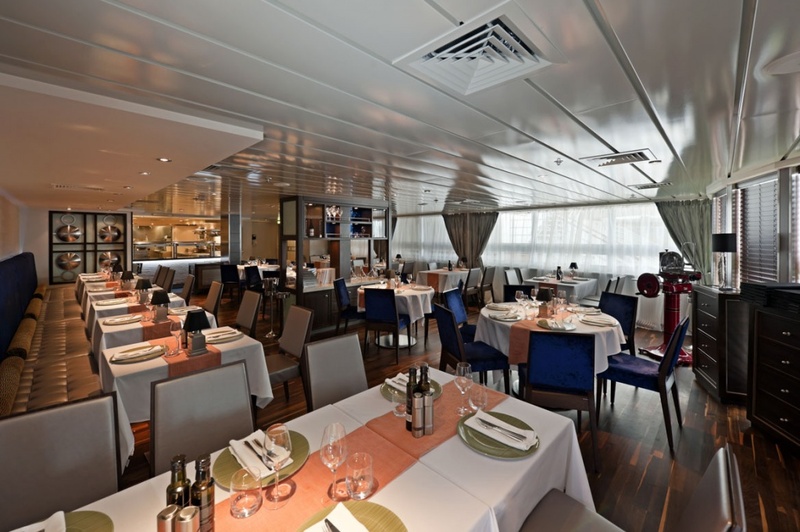 Salt Grill: Pacific Pearl is the most recent P&O vessel to introduce the Salt Grill restaurant. The highly polished wood floor creates a special ambience suited to the grill menu. 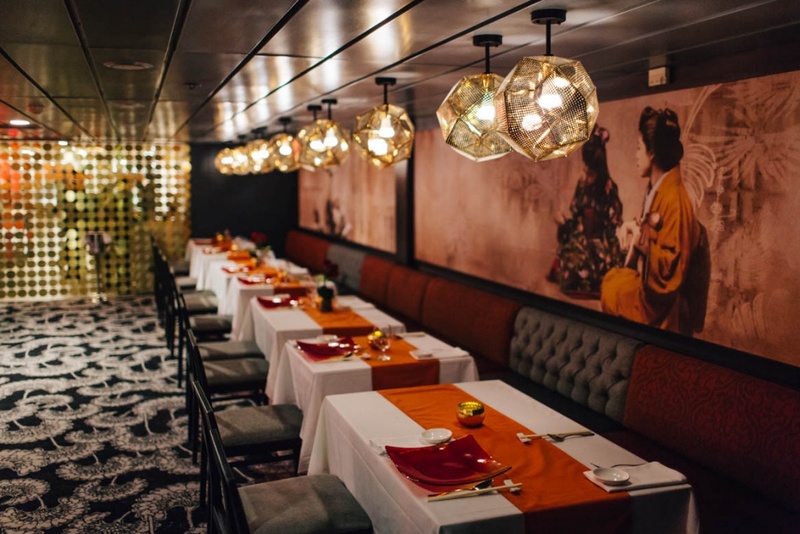 Although not a free dining option, Salt Grill is worth splurging on at least once or twice during a voyage, and bookings are recommended due to its popularity. The Grill: Not to be confused with Salt Grill, this is an Aussie BBQ experience where most items are free, including the famous grilled sandwiches. Some items incur a charge after 5 pm. The Chef’s Table experience, costing $95 per head, is a special treat that is limited to 14 people, and restricted to one time per cruise for any passenger. It is an enlivening evening that starts with a cocktail reception, heads off for a galley tour and ends in the Wine Room for a special dinner paired with the perfect wine. 24-hour room service is another option. You can even satisfy your cravings with a room service pizza delivery between 11 pm and 6 am. Special diets such as vegetarian and gluten free are also available on Pearl, with extra menu items provided for those who pre order a day in advance. On Pacific Pearl, you can choose to be idle and relaxed, or join in with the onboard activities that include ballroom dance classes, mixology classes, wine tastings, karaoke, trivia and even bingo. On the other hand, you could pull up a deck chair and take in recent release movies on the big outdoor screen on the pool deck. Between movies you can enjoy full-length concerts or catch up on the latest local and international sporting events. Evening entertainments range from Broadway-style shows, song, dance, comedy and magic. The Marquee theatre hosts large production shows such as the family favourite Pirates of the Pacific. A real highlight on Pearl is Pacific Cirque, an acrobatic troupe from Colombia that dazzle the crowds with stunning feats, fire eating, juggling and more. Special theme nights on Pearl are also a hit. Entertainment varies from island night to 60’s rock n roll and country and western. Getting dressed up and joining in with the line dancing is a great excuse to make new friends and socialise onboard. Clothes and accessories are available from onboard shops. 2015 is the start of a new era for Pacific Pearl. P&OEdge is a part of the action, and introduces us to a range of new activities such as climbing the aft funnel, riding a flying fox across the pool deck, and playing laser tag. 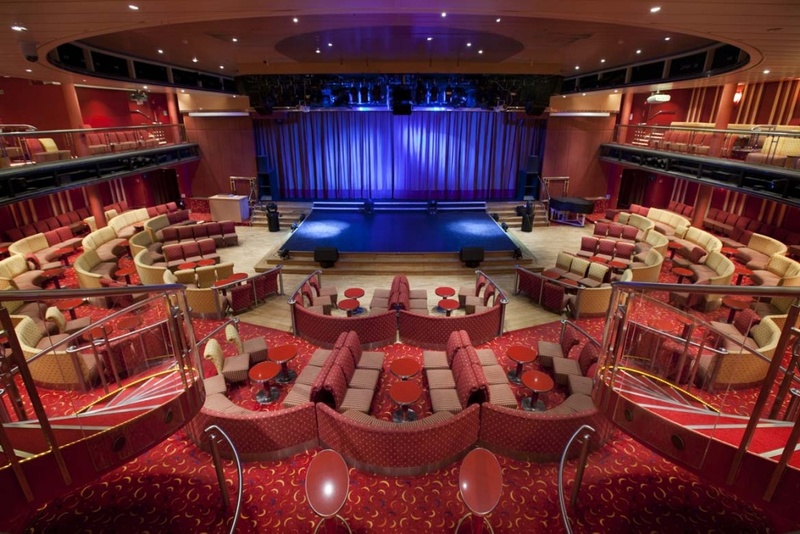 The central Atrium is a feature on all major cruise ships, and Pacific Pearl is no exception. It’s an elegant and inviting space great for mingling and people watching. Many events are held at the Atrium, along with art shows. Surrounding the Atrium are a range of outlets for purchasing onboard necessities or treating yourself to retail therapy in the form of jewellery, fashion, memorabilia and duty-free products. The Dome: A relaxing bar by day and entertainment and dance venue at night. Intimate and tasteful with floor-to-ceiling windows. The Orient Pub: Chesterfield-style furniture, rich upholstery, plush furnishings and a great drinks range make this a popular place to relax and enjoy the company of friends. Mix: Doubling up as both a cafe and bar, Mix provides great ocean views by day and live piano music at night. The small casino on Deck 5 is the place to try your luck on the gaming tables or slot machines. 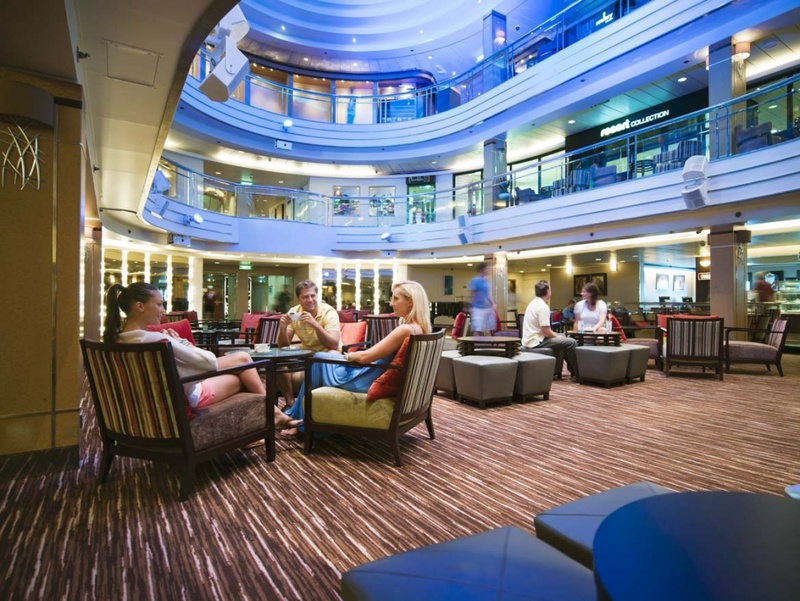 The Lounge on Deck 8 is where you can connect to the internet and update your friends back home about the voyage. 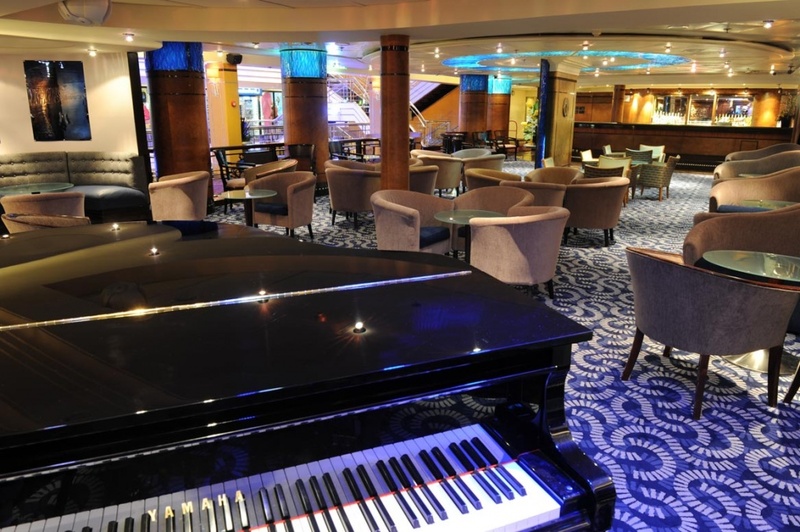 Pacific Pearl has Wi-Fi throughout the ship, but most people find the signal at The Lounge to be superior. 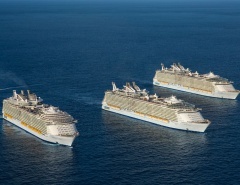 Due to the age of Pacific Pearl, the two pools are rather small in comparison to some ships. However, as the Pearl is a smaller vessel with a passenger capacity of 1,800, the pools are never too crowded. One of the pools is adults-only and includes a swim-up bar. The pool deck is also home to the New Zealand Natural ice cream parlour. Another special adults-only place is the Oasis toward the rear of the ship. This space includes sun lounges, comfy chairs, two hot tubs and a bar that is open all day. Refurbishments have improved the Aqua HealthSpaFitness Centre out of sight. A highlight is the couples treatment room which includes a shower and jacuzzi. There is also a comfortable relaxation area with four recliners. Spa treatment services include massage, facials, acupuncture, teeth whitening, fitness classes and health seminars. Deck 2 is also home to a beauty salon and gym that includes treadmills, weight machines and cardio equipment. When all is said and done, a voyage on Pacific Pearl can both indulge your senses and tone your body. Pacific Pearl cruises from Sydney for the majority of the year, and spends two months based in Auckland. Itineraries include New Zealand, Tropical North Queensland, Fiji, Vanuatu and even New Guinea. P&O’s Pacific Pearl is big on luxury and even bigger on adventure to new and exciting destinations. Download the Pacific Pearl deck plan here or click on the image below. 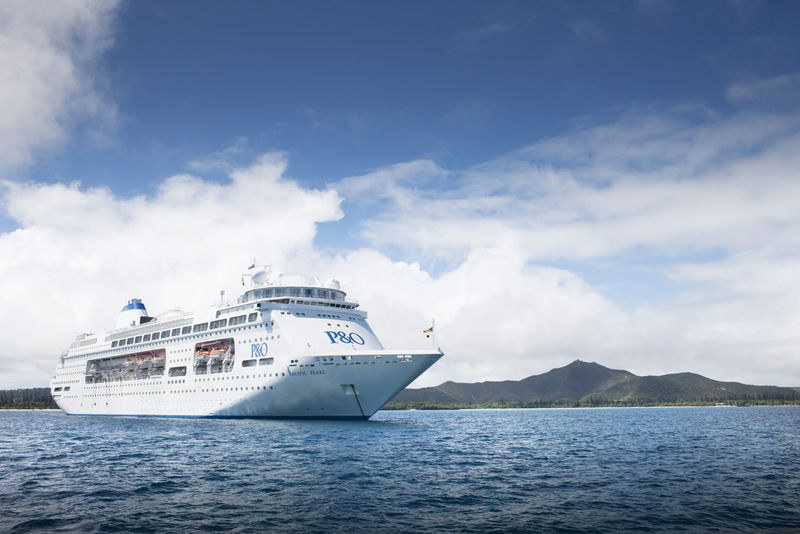 Have you sailed with the Pacific Pearl? Let me know what you think of this P&O cruise ship!